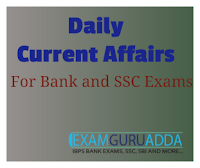 Dear Readers, we are presenting Daily Current Affairs for All Exams- 12th December 2016. 1. US Secretary of State John Kerry has been given the Legion d'Honneur, France's highest honour, with his French counterpart calling him "the most French of American officials". 2. Kerry's French heritage and fondness for the country saw him attacked on the presidential campaign trail in 2004, when he was the Democratic candidate running against Republican George W Bush. 1.Lt. Gen. Naveed Mukhtar has been appointed as the new Director General of the Inter-Services Intelligence (ISI). 2. He replaces Lt. Gen. Rizwan Akhtar who has been appointed as president of the National Defence University (NDU) in Islamabad. 3. Earlier, Lt. Gen. Mukhtar was the Commander of V Corps of Karachi from September 2014 to December 2016. 1. The famed Gotthard Base Tunnel (GBT) has started regular commercial rail service in Switzerland. The first regular train to use GBT ferried passenger from Zurich to Lugano. 2. The twin-bore GBT is world’s longest and deepest railway tunnel with length of 57-kilometer. It had overtaken Japan’s Seikan tunnel (53.9 kilometers) as the longest rail tunnel in world after it was opened in June 2016 for its maiden ride. 1. Madhya Pradesh Government has launched five months long Narmada Seva Yatra to turn the Narmada river pollution free. It was launched by Chief Minister Shivraj Singh Chouhan at Amarkantak. 2. The Narmada Sewa Yatra aims to create awareness about the conservation of the river. It is one of the biggest public campaign of the world to conserve river and environment. 1. China has provided Rs 15.80 billion to Nepal for post-quake reconstruction activities, a senior minister has said. 2. The Cabinet meeting yesterday decided to accept the grants worth Nepalese Rupees 15.80 billion provided by China, said Surendra Kumar Karki, Minister for Information and Communications. 1. India and Indonesia, the world's most populous Muslim nation, today agreed to strengthen defence and security ties with a major focus on maritime space and deepen cooperation for effectively combating terror, its financing, money laundering and arms smuggling. 2. In talks between Prime Minister Narendra Modi and Indonesian President Joko Widodo, the two countries with impressive growth rates also decided to boost bilateral trade and investment, particularly in areas like oil and gas, pharmaceuticals, IT and skill development. 1. New Zealand’s ruling National Party appointed the experienced Bill English as the country’s new prime minister following last week’s shock resignation of his popular predecessor John Key. The Centre has nominated Mocherla Sairam Bhaskar and Sunil Hukumchande Kocheta as part-time non official directors on the board of the directors of Canara Bank. Their tenure in office is for a period of three years.